River Valley junior Chase Caldwell produces a hit during an April 10 TVC Ohio baseball contest against Alexander in Bidwell, Ohio. WELLSTON, Ohio — Finally caught that big break. 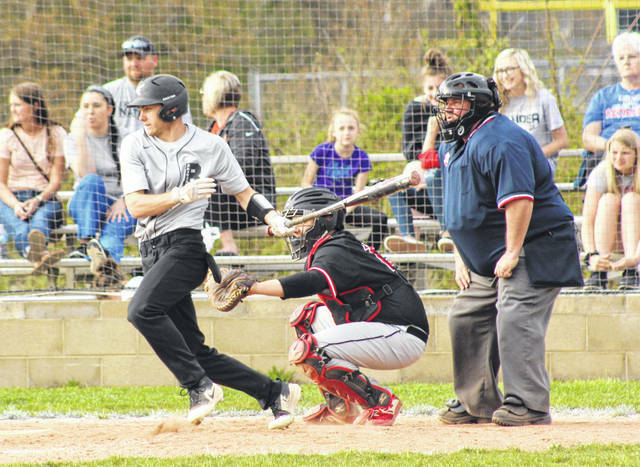 After a handful of extra-inning affairs and several close calls, the River Valley baseball team finally picked up its first victory of the 2019 campaign on Friday night with a 4-0 decision over host Wellston in a Tri-Valley Conference Ohio Division matchup in Jackson County. The visiting Raiders (1-8, 1-5 TVC Ohio) received a pitching gem from starter Chase Barber, who allowed only three hits and three walks over seven scoreless innings while striking out seven in the winning decision. The Silver and Black also put together an error-free performance behind their hurler, as the Golden Rockets produced only six baserunners total in the game — with only one managing to reach second base. The guests, meanwhile, used a pair of two-run innings to help put things away, starting in the opening frame of the game. Chase Kemper provided a one-out double to left-center that allowed both Dalton Mershon and Alex Euton to score, giving RVHS a quick 2-0 cushion. The Raiders stranded runners in scoring position in the second and sixth frames, but finally managed to tack on some insurance in the top half of the seventh. Dalton Mershon lifted a one-out single to left that plated both Wyatt Halfhill and Chase Caldwell, giving the guests a four-run edge headed into the finale. The Blue and Gold received a one-out single from Hunter Cardwell in the bottom of the seventh, but the next two WHS batters struck out and popped out to left — giving River Valley its elusive first triumph of the spring. The Raiders outhit the hosts by a 7-3 overall margin and also benefited from a single Wellston error. RVHS stranded four runners on base, while the Golden Rockets left three on the bags. Dalton Mershon led the Silver and Black with two hits and also drove in two RBIs, while Kemper, Halfhill, Caldwell, Alex Euton and Andrew Mershon also provided a hit apiece for the victors. Kemper also drove in two RBIs. Cardwell, Jeremiah Frisby and Jace McKenzie had a hit apiece for Wellston. Brice Randolph took the loss after surrendering two earned runs, three hits and a walk over two frames of work.